Amazon wants in on medtech. Bezos and company are betting big on the future of healthcare. Amazon began hinting at healthcare ambitions in late 2016 and has taken incremental steps since, including forming a healthcare lab and purchasing an online pharmacy company. Now Amazon has begun selling software that analyzes patient medical records for hospitals and their physicians. Although hospitals across the United States have been creating electronic patient records for years, Amazon’s software makes these records easier to search for key information, saving time and money by freeing up essential staff to take care of patients. Most notably the software transcribes handwritten notes, including medical jargon and abbreviations, saving doctors the time it takes to manually re-record their notes. If you’ve ever struggled to decipher a doctor’s handwriting, rest assured it’s hard for AI too. Amazon’s text-analysis software performed on par or better with other software and is capable of successfully gleaning the most important information from patient records, it claims. “We’re able to completely, automatically look inside medical language and identify patient details,” including diagnoses, treatments, dosage and strengths, “with incredibly high accuracy,” Matt Wood, general manager of artificial intelligence at Amazon Web Services, told The Wall Street Journal. Healthcare professionals can then export this data into easy-to-read records of specific information they can use to improve their services. 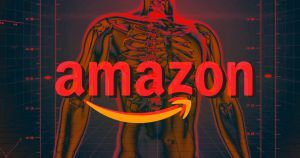 Patient data is subject to the notoriously strict Health Insurance Portability and Accountability Act, so medical records processed by Amazon can only be able to be accessed using a customer-specific authorization key. This isn’t the first time algorithms have been used to aggregate and analyze data. A 2015 initiative at New York’s Mount Sinai Hospital produced Deep Patient, which, similar to Amazon’s software, processed patient records and even went as far as to predict potential illnesses. Deep learning algorithms are excellent at processing large datasets, but the sensitive nature of the data in question means these processes must be handled carefully. Maybe Amazon’s early steps could foretell a shift from two-day shipping to two-day diagnosis — or even quicker.